Hat tip: M.C. Source: maannews.net – Bethlehem: Thirteen Greek Orthodox Christian leaders met in Bethlehem Wednesday and voted unanimously to boycott the reception of the denomination’s Patriarch Theophilos III for Christmas celebrations on 6 January. Officials and scout troupes affiliated the 13 will not receive the patriarch at the Mar Elias Monastery or meet him at the entrance to Bethlehem at Israel’s Checkpoint 300 for his procession to the Nativity Church. The decision came as a result of a meeting in the Orthodox Society headquarters in Bethlehem, following local leaders’ dissatisfaction with the patriarch’s unrealized promises to reverse land sales to Israel that saw the previous patriarch sacked. The former Patriarch Irenaios I was voted out of the position in 2005 by the Brotherhood of the Holy Sepulture, of which he had been the head. The congregation in Jerusalem had been increasingly angered by the sale of church land to Israel, much of which was private Palestinian land given to the church in trust before the 1967 war which saw Israel occupy the West Bank and annex East Jerusalem. The Pan-Orthodox Synod voted to support the decision in May 2005, and in August Theophilos III was unanimously elected as the replacement. He was confirmed by the governments of Greece, Israel, the Palestinian Authority and Jordan. Head of the Orthodox institutions council Marwan At-Toubasy told Ma’an boycott was in response to Theophilos’ refusal to abide by the promises he made to the Palestinian Authority when they agreed to confirm their support for him as head of the Jerusalem Church. Theophilos was confirmed by the government of Jordan, and issued a statement promising to serve the church and support the Palestinian people. 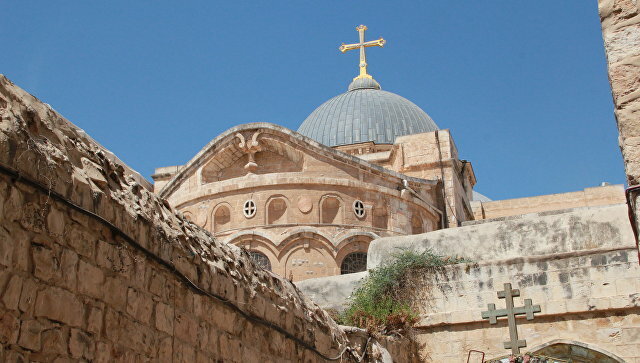 A spokesman for the church, Father Issah Musheh, called the decision to boycott a “personal issue,” and assured Ma’an over the phone that the celebration of Orthodox Christmas would continue as usual. At-Toubasy said the boycott is also a direct response to a deal made this year leasing the lands of Mar Elias to an Israeli construction company. The patriarch was accused in April of approving the lease of 71 dunums of land belonging to the monastery to the company for 99 years. From the deal the church would get 100 apartments. The congregation only found out about the lease, according to an interview the head of the Amman-Orthodox Society, Bassem Farraj, gave to the Jordan Times, about a lawsuit between two Israeli investors, one who had been leased more than 700 dunums of church land under Irenaios I, and the second developing the land leased by Theophilos III. The group of 13 Bethlehem leaders said they would inform President Mahmoud Abbas, Prime Minister Salam Fayyad, Bethlehem Governor Abdel Fattah Hamaiel, and the mayors of Bethlehem, Beit Jala and Beit Sahour about their decision. The group includes: Fouad Al-Bandak, Ibrahim Jaber, George Zeneh, Elias Es’eed, Na’eem Ayyoub, Ghassan Daoud, Khader Kokali, Marwan Tubasi, Fouad Skafy, Odeh Bishara, Khader Abu Abbara, Azmy Juha, and Michael Freij.